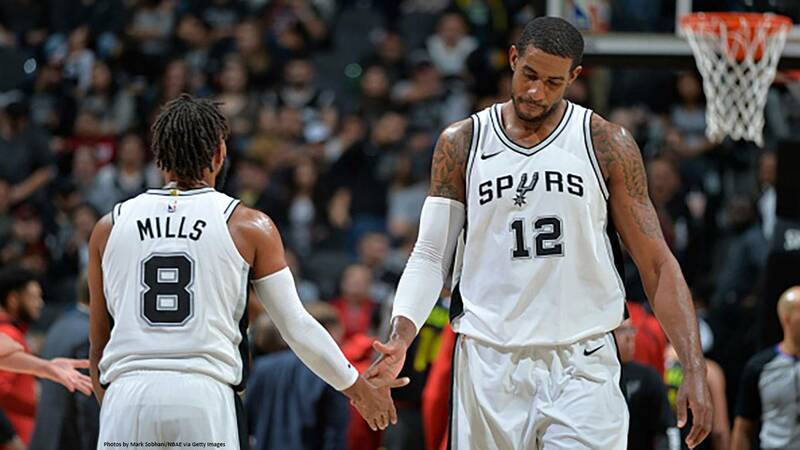 SAN ANTONIO - LaMarcus Aldridge had 22 points and 11 rebounds, and the San Antonio Spurs held off the Atlanta Hawks 96-85 on Monday night. Atlanta lost its 20th straight game in San Antonio, a skid spanning 20 years. Manu Ginobili had 16 points and Danny Green had 14 for the Spurs, who have won four of five. Kyle Anderson added 13 points, 10 assists and six rebounds in his 17th start in place of injured All-Star Kawhi Leonard. Aldridge powered the Spurs past the pesky Hawks, scoring 12 points with six rebounds in the fourth quarter. Aldridge saved the ball from going out of bounds after blocking Kent Bazemore's shot and then raced downcourt for a driving, one-handed dunk that gave San Antonio a 78-71 lead with nine minutes remaining. Green hit consecutive 3-pointers to stretch the lead to 90-79 with 3 minutes remaining. The Spurs finished 10 for 31 on 3-pointers. The Hawks forced seven turnovers in the third quarter to keep the game close, trailing 70-65 entering the fourth. Reserve forward John Collins led Atlanta with 21 points and Taurean Prince added 18. Former Spurs center Dewayne Dedmon had 11 points, including nine in the opening quarter. Hawks: Atlanta's last victory in San Antonio was Feb. 15, 1997. ... Hawks center Miles Plumlee did not play after being listed as probable with a strained right quadriceps. ... Atlanta has nine players with one year of NBA experience or less. ... The Hawks entered the game third in the league with 9.1 steals per game. They had seven against the Spurs. ... Atlanta, which had 21 assists, has at least 20 assists in 13 games this season. ... Atlanta coach Mike Budenholzer, a former San Antonio assistant, and Dedmon both received warm ovations during pre-game introductions. Spurs: San Antonio has already missed 52 games due to injury, including the season-long absences of Leonard and Tony Parker. San Antonio coach Gregg Popovich did not offer a timeline for either to return from quadriceps injuries. ... Anderson has scored in double figures in eight of 17 games this season after doing so just four times in 72 games last season. ... San Antonio matched a season-low by holding Atlanta to 38 points in the first half. ... Spurs and Kings are the only teams with just one player averaging 12-plus points per game. Hawks: Host Los Angeles Clippers on Wednesday night in the opener of a four-game home stand.